Manuscripts related to Thomas Orby Hunter "(fl 1740-1765) Treasury Commissioner"
1743-48: letters (47) to Henry Pelham, Yale University Libraries: Beinecke Library, see Osborn collection 6th biennial report Jan 1980. 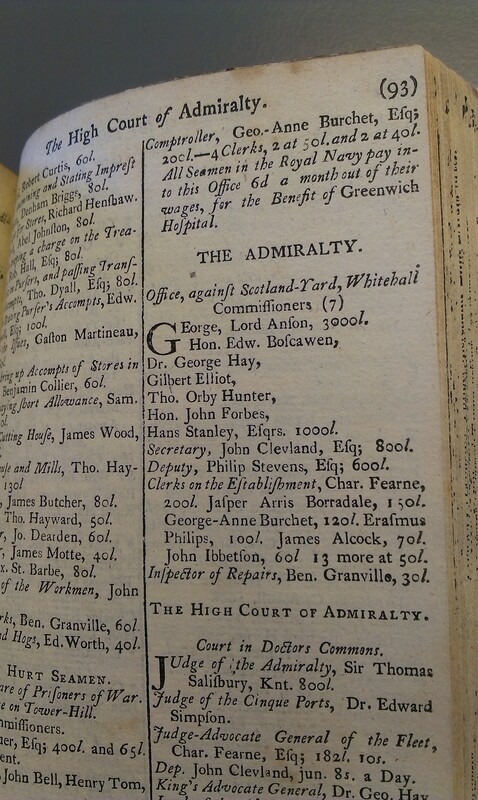 Listing for the Admiralty in [Watson's Almanack, Dublin, 1761]. 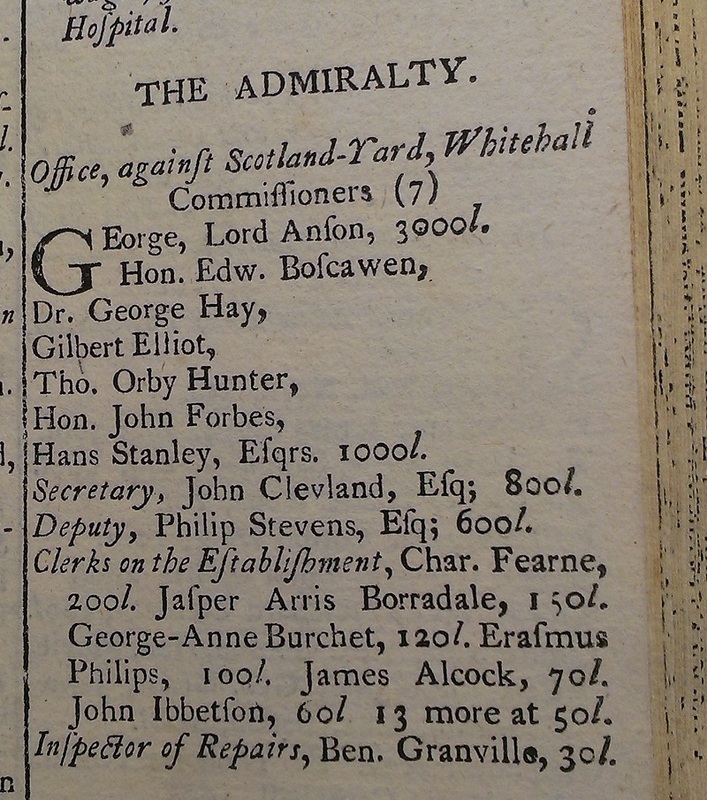 Shows Thomas Orby Hunter as a Lord of the Admiralty. of Croyland, Lincolnshire, NOT of "Croydon" (must be just an error for "Croyland"). His father became Governor of Jamaica 1727. He went to Jamaica with his father and brother 1727. His brother died in Jamaica 1732. His father's will, dated Jan 1733, left him his father's extensive property at Croyland, Lincolnshire and at Burton Pedwardine, Lincolnshire and at Chertsey, Surrey, and property in America and Jamaica, all provided that he did not marry a certain Mrs. Sarah Kelly, widow of Charles Kelly, of Jamaica. His father died in Jamaica Mar 1734. He returned alone to England. He obeyed his father's condition (or perhaps his father was simply not up to date!) and inherited the property. He mar 1stly, 5th June 1734, by licence, at St. Thomas a Becket, Warblington, Havant, Portsmouth, to Mrs. Mary Heming [or Maria, a widow]. He was member of the Spalding Society after his father, elected 10th Oct 1734. He was MP for Winchelsea, East Sussex, 1741-59 and 1760-70. He was stationed at Rotterdam 1746 as deputy paymaster for the English and Dutch troops. He bought Waverley Abbey House, Surrey 1747.
mar 1757 to James Fortescue and had issue. described as 2nd dau of Thomas Orby Hunter in [Mannings, 2000]. did NOT mar Sir Henry Goodricke (that is her niece). [LDS Ancestral File] says born Whitehall, Hampshire. Thomas mar 2ndly, 4 Apr 1749, St.Michael's church, Inkpen, Berkshire, to Jacomina Bellenden [born c.1730, descendant of Edward III]. Marriage licence dated 31 Mar 1749. Inkpen is close to his sister's house at West Woodhay (see map). Think did NOT marry at Broughton, Edinburgh. He was living Tickencote, Rutland, in 1754. Jacomina was NOT bur with her son George at Chertsey, 2nd June 1756, that is an error in the church records at St.Peter's church, Chertsey. Thomas served as a Lord of the Admiralty Nov 1756 to Apr 1763. He was on Government business in the Low Countries 1759. A diary survives from this time. His daughter Kitty eloped with the married Earl of Pembroke in 1762. Hunter River, Prince Edward Island, Canada, was named in 1765 after him. He died 20 Oct 1769, age c.55 yrs. He was bur Burton Pedwardine, Lincolnshire. Will pr 23 Dec 1769. Replaced as MP for Winchelsea 15 Jan 1770. Her will dated 20 May 1791. [Raymond Crawfurd] says she died 1791, age c.61 yrs, at her home in Bolton Street, Piccadilly (see map). Will said she wanted to be bur Burton Pedwardine with her husband. But [Raymond Crawfurd] says she was bur at St.George's Hanover Square, London. Will pr 28 Feb 1795. Charles Orby Hunter, of Croyland Abbey, born est c.1750. bur at Chertsey, 27th May 1756, age c.1 year. bur at Chertsey, 2nd June 1756, died at birth. died 7 Feb 1770, age 13 yrs, bur Farnham, Surrey. bur 6 Jan 1770 at St.Andrew's church, Farnham. Home of Thomas Orby Hunter. Kitty Hunter grew up here. died at his house in Dieppe, 26 Apr 1843, age 70 yrs. Translation completed by Pascal Ramé (poss. "Pascal Rome") and published Paris, 1845. See biography (formerly here) in [Seaver, 1929]. See biography in [DNB] (which is unable to identify his parentage).